Please Note: Although we are “appointment based”, we do accept walk-ins with an anticipated 15-30 minute wait (depending on the demand at the time a customer arrives). Look and feel your best at Shear Madness Haircuts for Kids! With cool vehicles like trains, cars and motorcycles for styling chairs (and normal chairs for older kids and adults) – as well as TVs and Xboxes at every styling station – our kids hair salons are designed to be a positive and memorable experience for young guys and girls getting their new haircut! Plus, what really sets Shear Madness apart from all other children’s salons is our unique selection of toys, games, books and hair accessories for both boys AND girls. It’s a great place to shop for someone special or just stay and PLAY! Kids Haircuts in Ankeny, Iowa! From FIRST haircut to FIRST date, our MADtastic Stylists are specially-trained to work with kids! Mix in the La De Da Spa, a great Ear Piercing experience, our amazing Hair Bows selection that you have got to see to believe, and our awesome Styling Staff, and it’s an absolutely fabulous formula for fun! Have a Kids Birthday Party Here! Our birthday parties are hosted in a special area in our salon, and are accessorized with fun activities and a karaoke machine for kids to sing along with their favorite songs! All parties are also led by our “Pink Starlets” so parents can focus on enjoying their children having fun and taking pictures if you choose. Click HERE for more information! Employment Opportunities: We are growing! 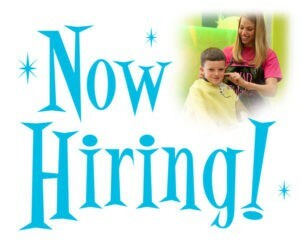 Are you a Hair Stylist with high energy and a great personality? Our stylists love the pay – they earn more here than expected! Cheery Receptionists and Party Helpers (Pink Starlets) are needed too! Come and join our happy family! Click Here to apply online! Find an exciting Shear Madness Haircuts for Kids location nearest you! Copyright © 2019 Shear Madness Haircuts for Kids. Powered by WordPress. Theme: Accelerate by ThemeGrill.